Introduced advanced frame caption bar. Added numeric format support to numeric indicator. And many other new and improved features. "The BCGControlBar Library was chosen for its rich feature set and MFC architecture." "We trialed several toolkits and while they all offered a decent set of controls, we found that BCGControlBar was the easiest to work with and most reliable." BCGControlBar Library Professional Edition and BCGSuite for MFC version 29.2 are available! This release includes Visual Studio 2019 Preview support, VS 2019-style visual manager and other new features and improvements. See the full list of changes here. BCGControlBar Library Professional Edition and BCGSuite for MFC version 29.1 are available! This release includes chart data binding, visual container themes and other new features and improvements. See the full list of changes here. BCGControlBar Library Professional Edition and BCGSuite for MFC version 29.0 are available! This release includes notification badges support, advanced frame caption bar, editor error indication and other new features and improvements. See the full list of changes here. BCGControlBar Library Professional Edition and BCGSuite for MFC version 28.0 are available! This release includes Ribbon Bar Auto-hide mode, new chart color themes, switch-style Boolean property and other new features and improvements. See the full list of changes here. BCGControlBar Library Professional Edition and BCGSuite for MFC version 27.3 are available! This release includes Extended tree control notifications and filter bar, Calendar bar with improved month picker, Grid control filter text highlighting and other new features and improvements. See the full list of changes here. BCGControlBar Library Professional Edition and BCGSuite for MFC version 27.2 are available! This release includes new Circular Progress Indicator, improved touch/gestures support, Ribbon Bar embedded in the dialog box and more. See the full list of changes here. BCGControlBar Library Professional Edition and BCGSuite for MFC version 27.1 are available! This is a maintenance release with some minor additions, improvements and fixes. See the full list of changes here. BCGControlBar Library Professional Edition and BCGSuite for MFC version 27.0 are available! This release includes SVG (Scalable Vector Graphics) image support, GDI+ graphics manager, enhanced planner control and more. See the full list of changes here. BCGControlBar Library Professional Edition and BCGSuite for MFC version 26.0 are available! This release includes new LightBox dialog, improved Property Grid, Tab state animation and more. See the full list of changes here. 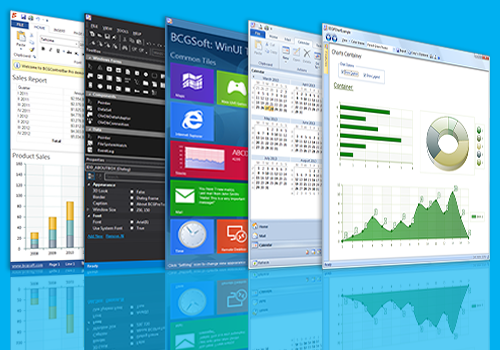 BCGControlBar Library for .NET version 6.0 is available! This release includes Visual Studio 2015 support, Office 2013/2016 and VS 2015-like Visual Themes and more. See the full list of changes here. "I've been using BCG for nine years now, and I'd just like to say that I think you're doing a really, really great job!!!" "I'll just use this opportunity to say you're doing a great job and we really like your products."